Boosting the strength and confidence of the government of Prime Minister Nouri al-Maliki has long been a Bush Administration goal in Iraq, yet the stronger and more confident al-Maliki becomes at home, the more inclined he has been to defy his U.S. patron. Most recently, the wily Shi'ite politician has been pushing back against Washington on the terms of a security pact that will govern the presence of U.S. troops in Iraq after their current U.N. mandate expires at the end of the year. With the clock ticking on a Bush Administration that is keen to finalize a Status of Forces Agreement (SOFA) before the expiration of the U.N. mandate  and its own  al-Maliki is holding out for the U.S. to back down from its demands for legal immunity for U.S. troops in Iraq and for their right to arrest and detain Iraqis. Deputy Foreign Minister Mohammad Haj Hammoud  the lead negotiator on the SOFA talks until al-Maliki recently took over  is confident the Iraqis will get their way. Already, says Hammoud, the U.S. has conceded that private security contractors working with the U.S. military and embassy staff will no longer enjoy immunity. But even if the Americans hold firm on the final two sticking points (which is likely) al-Maliki can grudgingly approve the deal and still ultimately get his way. That's because the agreement must be ratified by the Iraqi parliament, which is unlikely to occur without the U.S. conceding on the immunity and arrest issues. Whether he makes the stand himself or leaves it to the legislature, the end result will most likely be the same: no concessions, no deal. 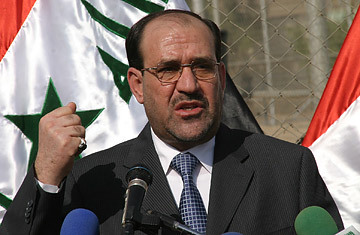 "He is clever," Hammoud says of al-Maliki. "He is thinking in a realistic way: without the agreement of everybody, the deal is not acceptable." Still, tough as his posture may have been on the crux of the deal  his insistence on a firm 2011 date for the withdrawal of all U.S. forces from Iraq, rather than Washington's preferred hazy "time horizon"  al-Maliki's position may not be as solid as it sounds. The 2011 date is "not a 100% time limit," Hammoud says. "It could be changed in the future according to the situation in Iraq," he says, adding that a joint U.S.-Iraqi committee will meet in 2011. "At that time, the government has the right to ask the Americans to ... either stay or leave." Looked at another way, that's pretty much what the Americans had asked for: a "conditions-based" withdrawal plan. But by demanding a firm deadline for withdrawal, al-Maliki has appropriated a key rallying point of one of his key opponents, radical Shi'ite cleric Muqtada al-Sadr. The Iraqi government acknowledges that its still fragile security forces are not yet capable of providing security and protecting the country's borders without U.S. help. Such successes as al-Maliki's forces have recorded against al-Sadr's Mahdi Army militia in Basra and Baghdad have been achieved with support from the U.S. military  and also through political agreements with al-Sadr. Still, the show of force helped extend the predominantly Shi'ite government's control into the south and burnished al-Maliki's image as a strongman and a nationalist, rather than a Shi'ite politician beholden to his sect. Despite his apparent confidence in his own power, however, al-Maliki has been looking increasingly isolated on the domestic political scene in recent weeks, upsetting friends and foes alike. He has antagonized his Kurdish allies in the ruling coalition by threatening to march Iraqi security forces into Khanaqin, an ethnically mixed town just outside the autonomous region of Kurdistan, currently controlled by Kurdish Peshmerga forces. The Sunni Awakening leaders who played a key role in tamping down al-Qaeda are also growing increasingly wary of what they fear are al-Maliki's plans to sideline them, raising the specter of renewed sectarian tension. And the Prime Minister remains at odds with Shi'ite opponents such as al-Sadr. So if he's standing up to Washington and annoying key constituencies in Baghdad, what's the source of al-Maliki's confidence? Who has his back? "I would like to know that as well," says Abdul-Karim Samerrai, a Sunni MP who is the deputy chairman of parliament's defense and security committee and a member of the opposition Tawafuk bloc. "A number of hot issues remain that can come to the boil at any time. Al-Qaeda is still here; the Sahwa [Awakening] issue; there are many wanted militia leaders who remain at large." Al-Maliki, as ever, is building his own influence through his ability to perform a delicate balancing act between the contending forces on the ground  and, irksome as the fact may be to Washington, Iran is increasingly influential in post-Saddam Iraq. Al-Maliki's pushback against Washington in the SOFA talks is widely seen as in part a response to intense pressure from Tehran. "They don't like to see Iraq in a good friendship with the United States," says Hammoud, who met with the Iranian foreign minister last week to allay Tehran's fears over the security agreement. "They think that the territory of Iraq will be the base for attacking Iran." A political analyst close to the government said that al-Maliki finds himself bridging the divide between the U.S. and Iran. "When you are the bridge between major parties, every side wants you closer to it," said the analyst. "It's part of the secret war between the U.S. and Iran; Maliki's one of the tools they use." The confidence exuded by al-Maliki, then, may simply be chest-puffing aimed at exaggerating the strength of his grip on power simply to keep hold of it. "The situation needs, for the time being, such an attitude," says Hammoud. "He is trying to balance the interest of his country and the pressure."